My sketchcrawl buddies and I met at Saul’s Restaurant to sketch tonight. Saul’s was really nice about letting us hang out for 3 hours and the food was delicious. It takes such discipline to draw it before eating it! 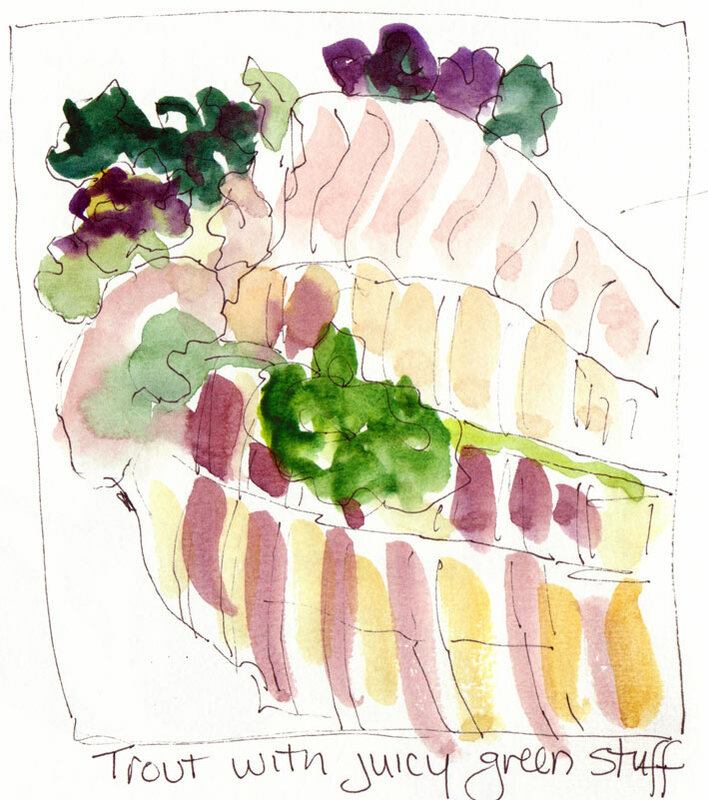 The owner of the restaurant does wonderful drawings herself, as can be seen on their menus and website. 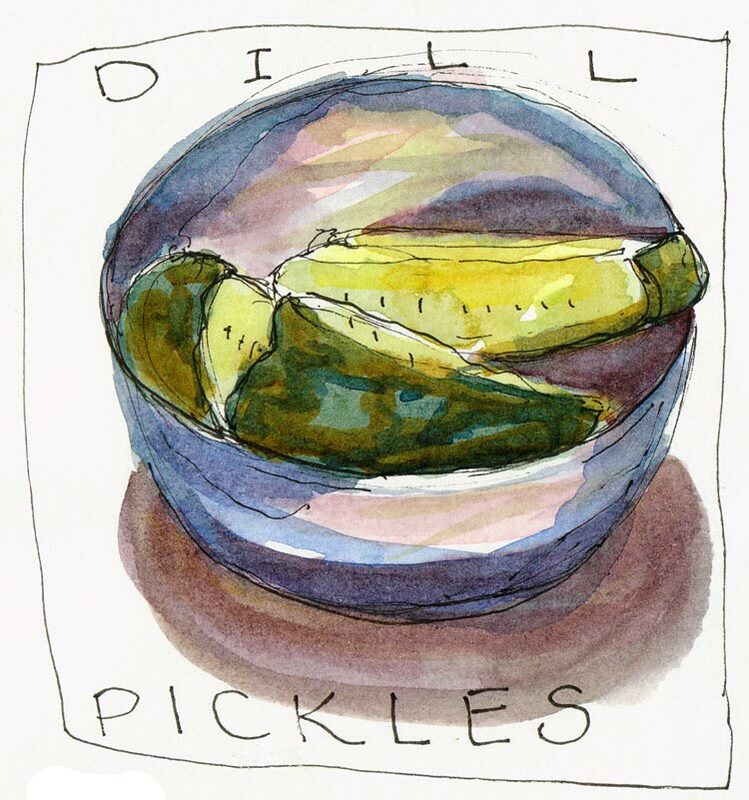 Except for breakfast, a meal at Saul’s always starts with their dill pickles. I had a plate of grilled trout with a bright green sauces and very colorful veges: kale and purple cauliflower. Then I got into a fight with a macaroon. I drew it, painted it, messed it up, and started over. Cathy and Sonia were ready to leave, having both done some really nice sketches, but I wanted to keep fighting with the macaroon, feeling like a flop. So I asked for a take-out container and brought the macaroon home. After drawing it several more times at home I finally won the battle with the macaroon which I’ll post next time. This is such a well presented and illustrated story! Love the sketches of food and the fight with the macaroon. Can’t wait to s see what your opponent looked like. Oh, I really, really like that restaurant scene! Great job! 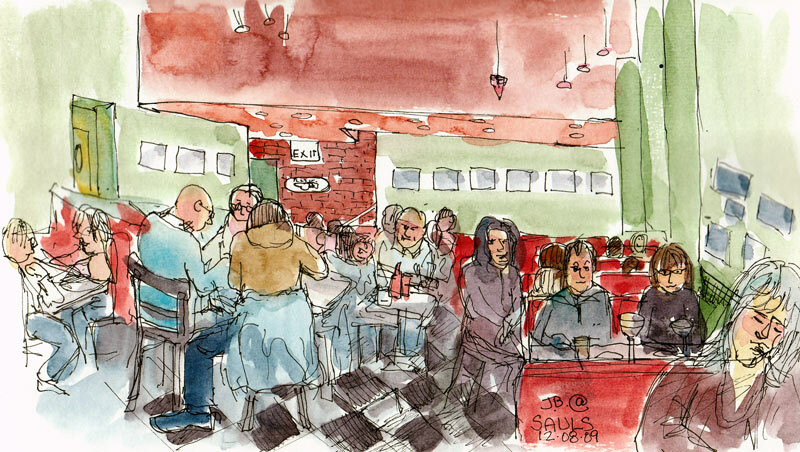 You mean you all go out to eat – but first you sketch the food? I want to come too! I do that all the time – but usually it’s just me on my own doing the sketching! Beautiful drawings. Come sketch anytime.